As we receive adverts from the LTA or from our website about holiday camps and resorts, they will be loaded here to provide you with a portal to all those alternatives. As a club we do not promote or recommend them, we just make them available to you. Feel free to submit new ones to the administrator of the website. My name is Felix Riba, the director of the CTR Catalunya Tennis Resort. A sport center located in the coast “Costa Brava” in Girona - Barcelona (SPAIN). We would like to offer you our resort as an option for your tennis players to go at any time of the year. Either dedicated players or amateur players, both junior and senior. Our sport facilities are 14 tennis courts (8 clay courts, 4 hard courts, and 2 synthetic grass courts), one football field (seven-a-side), and 4 padel courts. 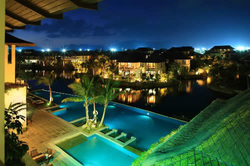 The resort has a four stars Hotel, a restaurant, three outdoor swimming pools, gym, and SPA. As you can see, our main focus is Tennis. We have been working on different packages and offers.The length of these packages can be changed depending on the client’s needs. There will be special offer for the coaches coming with the group. For other demands we can talk about it.The resort is located on a very peaceful area and surrounded by nature. Check our website and our presentation video for more pictures and information www.catalunyatennisresort.com and . http://www.youtube.com/watch?v=l3T7m-xGy38. 1- Tennis Escape: for families, tennis groups, groups of friends, and other groups who want to play tennis for two or more days (for example for a weekend) but also want to visit touristic places. 2- Tennis Holidays: for families, tennis groups, groups of friends, and other groups who want to play tennis everyday, but also want to visit touristic places, like visit Barcelona, the beach, and do other activities. 3- Training Camp: for a tennis team or a group of tennis players who want to go to Spain to practice tennis with their own coach; but they also want to visit touristic places. 4- Tennis Camp: For people who want to have an intensive tennis practice with our coaches. Jonathan Markson Tennis offers tennis holidays and tennis camps in England, Portugal, Spain, Italy, Cyprus, South Africa, Tunisia, Mauritius, Czech Republic, Hungary and the USA. The Best Tennis Holidays in Spain! La Manga Club Tennis Centre is simply one of the World's finest outdoor tennis facilities! Whether you just play tennis for fun or are a top professional, this is definitely the Spanish holiday for you. La Manga Club Tennis Centre is simply one of the World's finest outdoor tennis facilities! Over 25,000 agencies from 182 countries have voted the La Manga Resort in Southern Spain a European resort category winner of the prestigious World Travel Award - an award achieved by only the very best. The Annual World Travel Awards were set up in 1993 to celebrate excellence in the world's travel and tourism industry. Discover La Manga Club the perfect resort destination for your Spanish holiday.